The Palm Springs Air Museum is a flying history aviation museum that honors, preserves and educates the public about the Air Power of World War II, Korea & Vietnam, and its relevance and significance upon the course of history, and its impact on contemporary life.Over 59 flying and static aircraft displays are housed in 86,000 square feet of climate controlled hangar space and on 40,000 square feet of tarmac. There are no ropes preventing the public from getting up close to the vintage aircraft inside the museum, unless the aircraft is being worked on by the mechanics! Between November and May,Saturday programs with flight exhibitions take place, weather and mechanical issues allowing. There is a dedicated children's area, and the museum offers discounted rates for adult and youth groups of 15 people or more, with one payment transaction per group. Adult and youth tours are available with two weeks notice. One special feature of the Museum are the dedicated volunteer docents, many of whom actually flew the types of aircraft on display in the museum. Many give eyewitness accounts of the events and aircraft. Many served and survived in air combat during World War II, Korea and Vietnam. They are a priceless resource that is also a very finite asset of the institution. 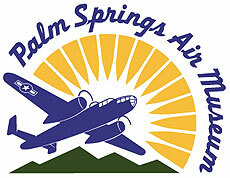 They are uniquely available to the Air Museum because of the splendid and healthy weather in Palm Springs that also draws millions of tourists to the region each year. Seasonal Hours: Open 7 days: 10am - 5pm, closed Thanksgiving, Christmas and the 3rd Friday of February for the annual gala. Deposit and Payment Policy: Deposit for groups of 50 or more. Company check upon arrival. Cancellation and Refund Policy: 24 hour cancellation notice.